Indonesia’s presidential elections, scheduled to be held in July, will be crucial to cementing Indonesia’s democratic reforms. As many developing nations around the world, like neighboring Thailand, actually have regressed from democracy in recent years, Indonesia has stood out as one of the clearest recent examples of successful democratization. In the late 1990s, as Indonesian politics began to open up, the archipelago was convulsed with violence, and at that time it was unclear whether the country would even survive intact. Battered by the Asian financial crisis, the Indonesian economy shrank by thirteen percent in 1998, and an additional ten percent of Indonesians fell into poverty between 1998 and 2000. The government of longtime dictator Suharto collapsed, and political authority crumbled in many regions. Terrorist organizations like Al Qaeda-linked Jemaah Islamiah mushroomed across the country, launching attacks like the Bali bombings in 2002, while outlying regions like Aceh, Papua, and East Timor attempted to secede from the country. All-out civil strife engulfed Timor, the Maluku islands, and other parts of Indonesia, while riots burned down large parts of Jakarta in 1998. But since the early 1990s, Indonesia has made remarkable strides. Indonesia has adopted a more inclusive political system, reduced the military’s authority, empowered local jurisdictions, achieved stability across the archipelago, and sustained strong economic growth of nearly six percent annually for more than a decade. A peace agreement in Aceh, the devolution of powers in places like the Malukus, and a deal to allow East Timor to gain independence helped calm tensions and prevent all-out civil war. These gains have produced a large and Internet-savvy new middle class across the country—Indonesia has the third-largest number of Facebook users in the world, after the United States and India—and have given rise to a young generation of politicians, men and women who do not hail from traditional dynasties. Yet Indonesia’s remarkable successes may have reached their limit, and daunting economic and political challenges remain. Some regions of the country, like Papua, remain plagued with separatist violence. Inequality remains a problem. Wages in low-income fields such as agriculture and apparel manufacturing are stagnant even as educated Indonesians command high salaries in areas such as finance and information technology. Corruption remains probably the biggest drag on growth, and threat to democratic politics; the decentralization of political and economic power in the post-Suharto era has actually in some ways made corruption worse, by increasing the number of government officials with their hands out for bribes. In all likelihood, Jakarta governor Joko Widodo, known universally by his nickname Jokowi, will win the upcoming elections. 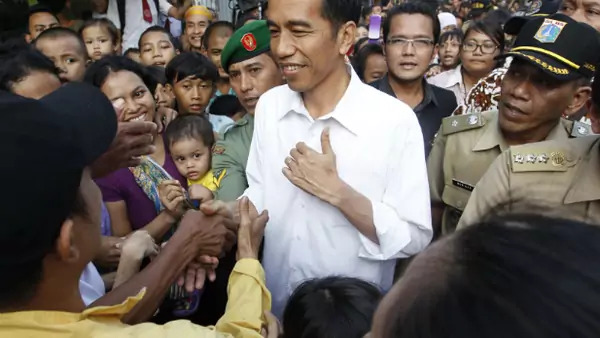 (Although Jokowi has not yet formally declared his candidacy, nearly all his allies and advisers say he is running for president this year.) In the elections, Jokowi will rely upon not only his own charisma, his regular-guy appeal, and innate political instincts but also the powerful machine of former president Megawati Sukarnoputri’s Indonesian Democratic Party-Struggle, or PDI-P. Jokowi knows exactly how to manage his image, how to project the regular-guy appeal that, in a country that has never known such a politician, has proven enormously popular. In pre-election polling, no other presidential candidate gets even a quarter as much support as the Jakarta governor. The closest challenger, former general Prabowo Subianto, not only cannot match Jokowi’s personal touch and (in PDI-P) formidable political organization but also remains tainted by allegations of involvement in the killings of democracy activists during the Suharto era. That Jokowi likely will dominate the presidential election seems sure. What is not sure is how he will govern. Though dynamic, media-savvy, and results-oriented, Jokowi has only served as mayor, although he has been major of two large cities. He has no experience in foreign policy, national-level economic policy, trade policy, and other issues, and he has hesitated to even offer thoughts on how Indonesia should conduct its foreign policy. He also will have to contend with the many rivalries inside PDI-P; just because former president Megawati is willing to pragmatically throw her support to Jokowi does not mean that she is going to give up her plans to eventually maneuver her children into positions of power. But as president, Jokowi will not be able to avoid the terrain of foreign relations, economics, and trade. And with its economy booming and its politics more stable, Indonesia has in recent years returned to its natural position as the leader of Southeast Asia, and also has assumed a major voice in international forums like G-20 group of economic power. The country has enormous untapped natural resources, but many Indonesians have been angered by environmental abuses linked to previous foreign investment in resources like copper, gold, and oil, and want to redraw the terms of foreign investment in the future. Already, in the past three years Indonesian lawmakers have passed new legislation attempting to restrict certain types of foreign investment and hand control of natural resources back to Indonesian firms. In private, and in some of his actions, Jokowi has offered hints of how he might govern as president. He maintains a strong commitment to democratic institutions, including secular courts and the country’s anti-corruption commission, and his election probably would strengthen these independent institutions and move along Indonesia’s democratic transition even faster. He also has demonstrated streaks of populist economics, the kind of pro-state intervention but also capitalist economics popularized by other developing world leaders such as former Thai prime minister Thaksin Shinawatra and former Brazilian president Luiz Ignacio Lula de la Silva. Jokowi has called for the government to take back control of much of the economy, in what he called a “people-centered economy.” He also seems likely to support not only Indonesian power in Asia, even at the expense of traditional relationships like that with Australia, but also Indonesia’s growing willingness to stand up for democracy and human rights in the region, such as pushing the Myanmar government to reform. As he formally announced his candidacy, these views should come into clearer definition.